One of the most efficient and effective ways to maintain a drug-free workplace is with periodic K9 searches for illegal substances. These searches are safe, discreet and confidential. The goal is to let you make the best decisions for your company. We search employee areas and indicate when an illegal substance is detected. Scents that can be detected include heroin, crystal meth, crack/cocaine, Molly/Ecstasy and more. We welcome the opportunity to speak with you. Illegal drug use can dramatically impact a company’s bottom line. It can affect employee performance and absenteeism, medical costs, and theft. Additionally, customer perceptions may be negatively impacted. One search may costs a fraction of what it would cost a business – in both time and money- to rebound from lost productivity, ruining your reputation and worse, become a PR (Public Relations) disaster. Is this something you’re worth risking? 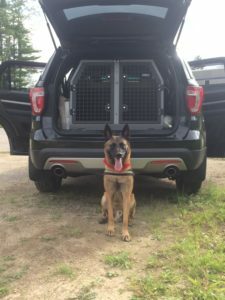 At Discreet Interventions, K9 search is the optimal choice. I’m Tom Robichaud, and I’m not affiliated with local law enforcement or any other government agencies. I’m an independent resource so you may find peace-of-mind, avoid costly mistakes, and ultimately, save a LIFE. I help you find ways to avoid embarrassing law enforcement investigations, plus potential or additional legal expenses. My k9 team provides a single drug sweep to your facility. Or, I can create customized, ongoing programs to maintain a drug-free workplace. If contraband is detected, I’ll identify the specific location. Moreover, your management team gets to make the decision on best practices and next steps so you’re compliant with THE company policy. 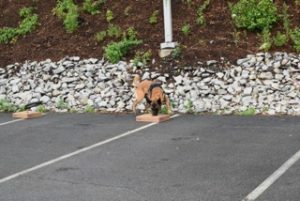 K9 narcotic sweeps in the workplace is vital if an employer is to protect themselves and all their employees. Turning a blind eye to substance abuse is not the answer. Health and safety isn’t just about hazardous chemicals and spillages, it’s also about an individual being fit for work. Don’t let substance abuse impact your workforce. By running a K9 narcotic sweep program you’ll reduce the risk of accidents or even death. You’ll increase productivity and less absenteeism due to legal or illegal substance misuse. Random sweeps with a certified K9 sends out a clear message that drug and alcohol abuse will not be tolerated.